To make the marinade, stir together the garlic, oil, lemon, oregano, paprika and seasoning. Add the chicken and mix thoroughly. Cover and refrigerate for at least 2 -12 hours. To make the salad, simply mix all the ingredients together. To make the garlic sauce, mix together the yoghurt, garlic, parsley, lemon juice and a pinch of salt. This can be made up to a day in advance if it's easier for you. Heat a griddle pan until smoking. Thread the pieces of chicken on to two wooden skewers (if you soak the skewers before using them, they will not burn). 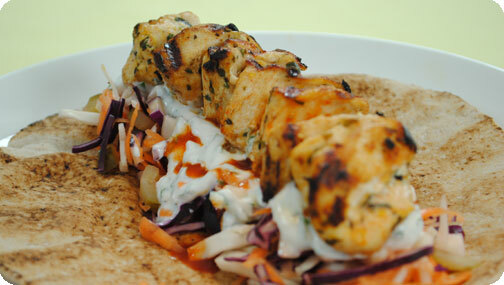 Lay the kebabs on to the griddle and cook for five minutes on each side or until cooked through. Lay the wraps on two plates and spread over the garlic sauce. Lay on a handful of salad, then top with the chicken and some chilli sauce and wrap up.